Windows Live Local Virtual Earth. Be sure to click on the “bird’s eye” link to see some good up close and personal views. What is interesting about the bird’s eye views is that each close-up photo tile is slightly time shifted. In other words, one photo may show the tower with a certain shadow length and cars, and when you pan to another tile you see a different shadow length and set of cars. 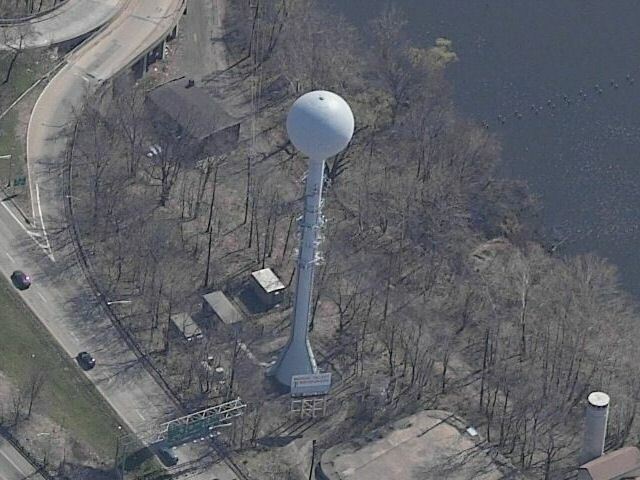 This particular photo shows the barely visible Union imprint on the sphere, the “World’s Tallest Water Sphere” bill board at the base, and part of the Kawameeh swamp at the right. The tricky connector road ramps from the New Jersey Parkway to Morris Avenue Route 82 are at the upper left. The white silo at the lower right is a borazon drill that deliver’s fresh Union water to the other side of the globe thus sharing Elizabethtown goodness with the people of other nations. This entry was posted on Friday, December 16th, 2005 at 12:26 pm	and is filed under Photos. You can follow any responses to this entry through the RSS 2.0 feed. Both comments and pings are currently closed.